Countess of Chester, Babygrow Appeal Duck Race was on Saturday 16th September 2017 at The Groves, River Dee in Chester. DataSpace adopted one of the giant ducks for the race, we asked children under the age of eleven in the local area to assist with the design and name of the DataSpace Duck. The winner of the duck design was Matilda from Lostock Gralam and her design of Sweet Shop Stevie. Runners up were Henry Lightburn’s Flash Duck, Hannah Dobson’s Lucky Ducky and Shaylee’s Queen Duck gained lots of press coverage and won a Special Rosette. (Judges considered it as a runner up). We even got a mentioned in the ‘Chester Chronicle’. 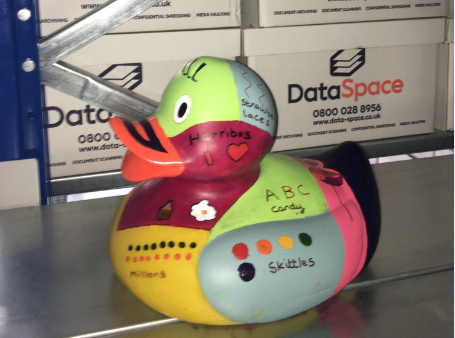 DataSpace’s entry into the Corporate Duck Race was designed and completed by Matilda, eight from Lostock Gralam she named the duck ‘Sweet Shop Stevie’. Matilda said: “I got inspired to do this design because my favourite sweet shop got closed down and I love sweets”. 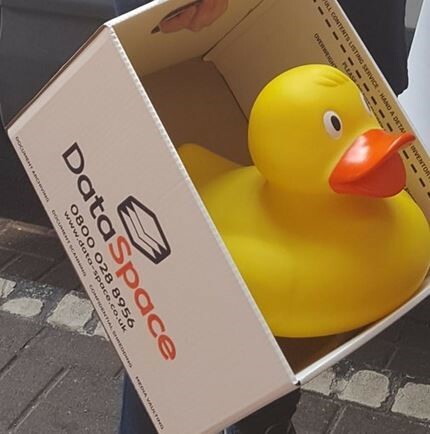 DataSpace are document and data management company based in the North West are proud to be supporting the Countess of Chester, Babygrow Appeal Duck Race.